HomeRockfall mitigation on the important railway in Slovakia using Steelgrid HR PVC. 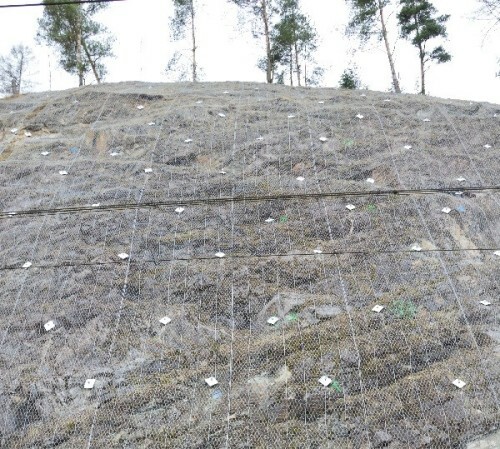 Rockfall mitigation on the important railway in Slovakia using Steelgrid HR PVC. Rockfall mitigation on the important railway Zilina – Kosice in Slovakia between the cities Svit – Strba and Vydrnik – Poprad-Tatry is under construction right now. Train transport is one of the most important ways of travelling in Slovak Republic. The railways create a dense network in the whole country. Žilina railway station serves the city and municipality of Žilina, seat of the Žilina Region, northern Slovakia. The station was opened to the public in 1871 and is an important railway junction between the Bratislava–Žilina railway and the Košice–Žilina railway, both of which form part of Slovakia’s main east-west rail corridor. It is also a junction for two other lines. Rockfall mitigation on the important railway Zilina – Kosice in Slovakia between the cities Svit – Strba and Vydrnik – Poprad-Tatry is currently being installed at the site. The only rockfall mitigation chosen by the contractor is going to be constructed using Maccaferri’s high strength mesh composite – Steelgrid HR. The locality in question is located right on the railway station Spissky Stiavnik, where the height of rock slope is more than 20 m. The slope is stabilized by high strength mesh composite Steelgrid HR PVC, rod anchor with Steelgrid HR Plate and additional cables, which make the secured drapery more efficient. The Steelgrid HR is a complete system to provide surface stabilisation of unstable and loose rock or soil slopes. The Steelgrid HR mesh is a composite material made by two components: double twisted wire mesh and high tensile strength steel cables, which are woven into the mesh directly during the manufacturing process. Due to its high strength and high stiffness, which are the main advantages of Steelgrid HR PVC, this product can transfer the high loads from loose rocks into the anchorage systems. Steelgrid is commonly used as a drapery, and as high strength bolted facings. The system benefits from a comprehensive corrosion protection comprising highly corrosion resistant GalMac, (Zinc, Aluminium alloy) galvanising. The secured drapery stabilizes the rock slope and limits the rockfall on railway and helps to operate safely on the railway. The installation of Steelgrid HR into the railway project is straightforward; the adjacent lateral rolls of mesh do not need to be overlapped, reducing product wastage and saving installation cost and time compared to other meshes. To get more technical information, please download our technical document.